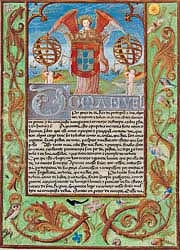 43 splendid frontispieces illuminated in gold, the book is now preserved in the Archivio Nacional de la Torre do Tombo in Lisbon. It was illustrated by some of the gratest names of the portuguese art: Antonio de Holanda, Alvaro Pires and Antonio Godinho. 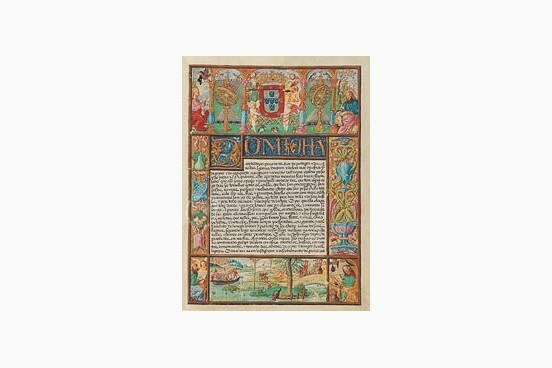 Manuscript book on parchment − 53 × 40 cm − 90 pp. 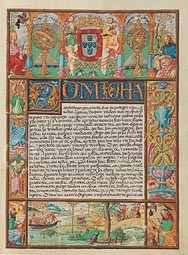 Full-size color reproduction of the entire original document, Leitura Nova of Manuel I of Portugal: the facsimile attempts to replicate the look-and-feel and physical features of the original document; pages are trimmed according to the original format; the binding might not be consistent with the current document binding.